Root and Stem on Grand Ave.
Summer is the most expansive and yang time of year. The long days, warm weather, and availability of abundant natural energy make it the ideal time to be out and about working on projects, playing, and connecting with friends. The element of the summer season is fire, which in Chinese medicine is linked with sociability, joy, productivity, celebrations, passion, and expansion. These principles should guide our actions through the season. At the same time, the heat and expansion of summer can get to be too much if we don't remember to cool and slow ourselves down a bit to create some balance. The summer is the ideal time to put lots of hard work into any projects we started in the spring. Just as seeds we planted in spring are now growing quite quickly in the summer heat, our projects an rapidly expand with the extra time and energy available to us in this season. If all goes well, we will be provided with an abundant harvest that will help carry us through the cooler, darker days of winter, when we may not have as much productive energy. Pushing ourselves a bit now makes it possible to take advantage of the dreamy winter months to rest and restore our bodies. Exercise can be somewhat vigorous in the summer. For most people, sweating during the summer months is good - it helps eliminate toxins and keep all of the fluids in your body moving. Be sure to stay hydrated and don't overheat!! Connecting with friends and family is also an ideal summer activity. Larger gatherings and more superficial conversations may naturally happen - we are all more externally focused and want to do it all! Don't push for deeper connections, though you may stumble upon them, as people's hearts are more open in this season. And don't forget to rest! Though there is abundant energy available, taking a mid-afternoon nap keeps us out of the hottest part of the day, and lets the mind and body slow down a bit to nourish the yin energies, which are not as naturally abundant at this time of year. We are aiming for a good yin/yang balance. Take advantage of the abundance of fresh fruits and vegetables! Go to the farmer's market and make a simple, fresh dinner out of whatever catches your eye. It is also advisable to eat moist and cooling foods to help combat the heat. 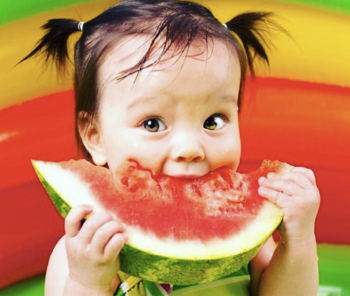 Melons of any type are naturally cooling and refreshing during summer months. Cucumbers, tomatoes, and zucchinis also provide cooling energy to the body. Be sure to stay hydrated with water, as well as cooling teas and soups. Examples of cooling teas are green tea, hibiscus, chrysanthemum, and mint. Miso soup is also cooling - boil some of your fresh vegetables for a short time and add a spoonful of miso paste for an easy, cooling summer dinner. The best way to use the energy of summer is to enjoy yourself! But, as with most things, moderation is also important. If you find yourself feeling too hot, having night sweats or insomnia, becoming irritable or angry, and having more anxiety than usual, that may be a sign that you have overdone it. Take a break from productivity and high speed socializing to eat watermelon in your hammock or have a lazy day by the lake (make sure to find or bring some shade). Here is a cooling summer tea recipe to help you on those warm days. Enjoy! Steeping this tea overnight in the moonlight adds to it's yin nourishing qualities. Put the herb and water in a quart jar. Leave outside overnight where the jar will catch some rays of moonlight. If the moon isn't visible that night, that's ok too - the night has plenty of yin energy! Enjoy the tea throughout the day by sipping at room temperature or with ice.